You could easily spend a fortune in a bike shop and get lots of fancy accessories, but you don't need that much. I always use a helmet for obvious safety reasons and there a few other items that I usually carry on my cycle trips. This page highlights the items that I have found to be the most useful. I have split this page into gear for the bicycle and clothing. These are bicycle specific bags that clip on to racks at the rear or front end of the bike. They are essential for overnight trips so that you can carry your belongings. 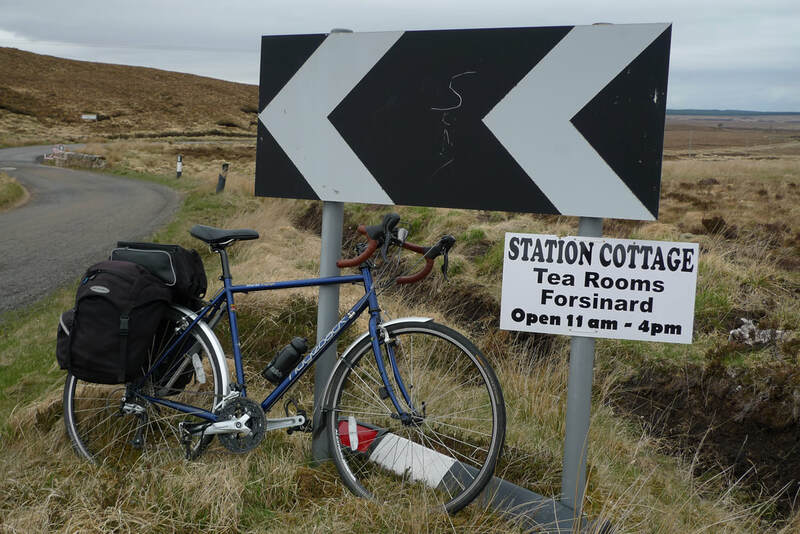 This photo shows my bike kitted out with rear panniers fitted onto a rack on the back of the bike. I have Altura panniers and they have lasted me for about 15 years, so the initial outlay will be paid back. My panniers have waterproof covers that are 100% effective at keeping everything dry. This is the most important feature when selecting panniers. You need them to be waterproof. Expect to pay around £60 for a pair of good quality panniers. I always carry a bottle of lubricant for the chain. When your gear changes are no longer smooth and the chain sounds like it is not running as smoothly this is a sign that you need to add lubricant. Regularly adding lubricant to your chain will make your chain last longer and reduce the chances of it needing to be replaced as often. You can pick up a bottle of lubricant for less than £10 and it should last you a few years. I currently use Muc-Off wet lube. ​It is not a legal requirement to wear a cycling helmet in Scotland. You will come across numerous for and against arguments about making it the law to wear one. I choose to wear one because I believe it will provide me with some protection in the event of a fall. Read my review of the Livall Smart Helmet which has indicator lights and other cool features. These are one of the best investments you can make for cycle touring. If you cycle any distance you will soon discover that sitting in a saddle becomes painful. Padded shorts eliminate that pain and I never leave home without them. My current shorts are made by Endura and they work very well. They are antibacterial and wick away moisture. Expect to pay around £20-£25 for a good pair of padded shorts. If you want to cycle outside of the summer months in Scotland a baselayer is essential to keep you warm. Even in summer the weather can be chilly so pack one in your panniers just in case. A baselayer traps warm air against the body and also moves sweat away from the skin. They tend to be made from synthetic materials or merino wool which is much better than wearing something made of cotton which is just going to soak up sweat and this could cause hypothermia. You can pay a lot of money for a baselayer, but something costing around £20 should be decent enough. Another essential item for dealing with Scottish weather. If it is pouring with rain and there is a cold wind it is going to be very miserable and uncomfortable if you do not have a good pair of gloves. However, if you plan to only cycle in the summer gloves may not be necessary, but remember that cold winds and cold rain can happen even in summer in Scotland! This is an absolutely essential item in Scotland. Jackets from cycle shops will be in bright colours and reflective material so that you can be seen easily by traffic, although there have been debates about how effective high vis actually is. The number one quality that your jacket must possess is that it will keep out the worst of Scottish rain. This is another piece of kit where you can fork out a lot of money, but I have been using a jacket bought in discount retailer Aldi. I have had it for almost 10 years and it does a great job. However, if the rain is really, really heavy and goes on for hours and hours the water will come through. Get your jacket from a discount retailer and expect to pay £25 or go for something top end and you can be paying over £100. Whilst we are on the subject of rain there is another product that I find essential. Waterproof overshoes will keep your feet dry in a downpour. If the rain is heavy your shoes will get waterlogged and make them heavy and uncomfortable. If this situation goes on for hours your feet will start to get cold. It is not a nice feeling and it will make the ride miserable. Waterproof gear simply makes cycling more enjoyable if you come across bad weather. Overshoes are pulled on top of your shoes in the same way that you pull on a pair of socks. Velcro secures them in place. I use Pearl Izumi overshoes which are very good quality and keep you dry. If the rain is relentless and goes on for hours you will start to feel wet, but I wonder if any overshoe can stand up to the worst of non-stop Scottish rain? These overshoes cost around £50, but I bought them as an investment and do not expect to replace them for many years. If you are keeping your chest dry, your feet dry and your hands dry why not keep your legs dry? I have a pair of Altura waterproof trousers that do an excellent job of keeping the rain out. They can be pulled over my shoes or whatever shorts or trousers I am wearing, so if it starts raining heavily all of a sudden I don't have to waste time taking off my shoes. If I had to do without one of the waterproof items I have listed here it would be the trousers. If you are wearing shorts it is not a big deal for your legs to get wet for a bit. They are not going to get uncomfortable in the same way that feet and hands will. You can get a decent pair of waterproof trousers for about £25 to £30.